I would like to explain the term ‘Applehead’ to you. Left and below are photos of seal point Champion Inwood Shadow. 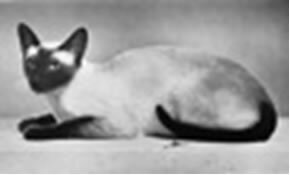 In my opinion, possibly the most beautiful Siamese of all time. She was born in 1947 and owned and bred by Mrs McGregor. She has a well balance head and her eyes are the right shape. Her body colour was pale. This is the style of cat that I think is correct. I will no doubt have opposition on that one. Sorry about the picture quality but you can still see the body and head shape. I am only too sorry that this type of cat has gone out of fashion with a lot of breeders. 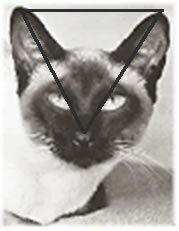 I am doing my best along with a few others (and I stress, only a few) to keep the old-style Siamese going and hope more breeders will follow in time.